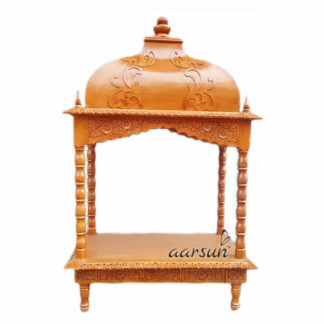 Aarsun Woods presents to you Handcrafted Wooden Pooja Chowki / Deity Chair for Worship. Wooden Pooja Room is one place we can be at peace and directly connect with Lord. The place where the idol is kept is equally important. Almost every home in India or in abroad have a separate place for keeping Idols and other pooja essentials. The place is considered auspicious and is close to heart. Wooden Chowki is to be considered best for placing pooja idols on in Pooja Rooms. We at Aarsun Woods, provides custom made pooja chowki for your home, office or any other place. The designs are handcrafted by skilled craftsmen and are highly customizable. The customizations depends on your need as each home has separate requirements depending upon the size or location of the area where the chowki needs to be placed as well as Vaastu. 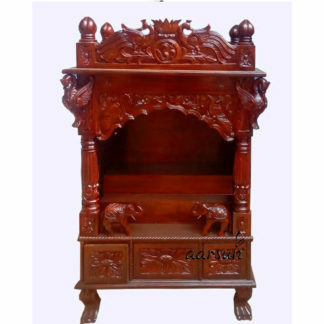 For Vaastu Compliance for Wooden Temples and Chowki, you can find our detailed post here. This particular Pooja Chowki consists of a beautiful floral carvings in front of the drawer as well as at the back. the whole design clearly shows Indian Style in depth profusely found at a number of Temples in India. The wooden chowki consists of 3 pull out slider drawers in front: a larger one at the center and the smaller two at the adjacent. The depth of the drawers goes all the way back to the chowki and have ample space for keeping all your pooja essentials at one place. The chowki is enclosed with curvy sides and back with similar floral carvings as in front of the drawers. The Idols can also be placed with ease. There is an ample amount of space for keeping more than one Idols at the top. The whole Pooja unit is supported by four legs at the base that too carved elegantly in Lion-leg shaped design. The Pooja Chowki is popularly used for placing Lord Krishna and Lord Ganesh Idols. 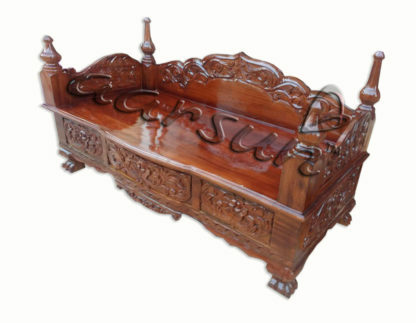 It is made from premium quality Teak Wood without any use of an additional material which makes it even more captivating. The finishing (final shade) is made available in Natural Brown ( as in Mandir Model No. 175 in Sheesham) or in Dark Walnut Shade as depicted in the adjacent images. Moreover, the unit can be customized in your size requirement. Teak Wood has a very aesthetic appeal straight grain pattern coupled with a rich golden-brown color. In addition to this, it really feels great to touch when compared to another hardwood types in the range. Teak Wood is obtained from broad leaved deciduous trees which are exceptionally strong. Teak Wood is very durable and with proper care, lasts for years. Teak Wood has natural oil content that resist termite and fungus, and other insects that might harm other wood types. Teak Wood also has a good resistance to moisture and water. Teak wood has high dimensional strength and does not warp or shrink too much.